links to district maps and Gotham Gazette’s Gotham Voters profile page. The three citywide races are presented first, followed by boroughwide offices, then state assembly vacancies, concluding with city council races by borough. 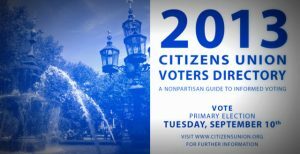 In addition to this online version, you may also see the print version of the 2013 Primary Election Voters Directory and Citizens Union’s press releases regarding our 2013 Primary Election preferences for borough-wide and city council races, as well as the release for citywide races. All questionnaires submitted to Citizens Union for contested primary elections are available; please note, however, that due to limited capacity, Citizens Union is not able to evaluate every race taking place in New York City. Our past preference and endorsement decisions are also available. Melinda Katz preferred over Peter Vallone, Jr.